Get 10 lbs of Fresh California Lemons shipped right to your door! High in Vitamin 'C' and filled with tangy juice, these lemons will soon have your mouth watering as you use them in your favorite drinks, and food recipes. 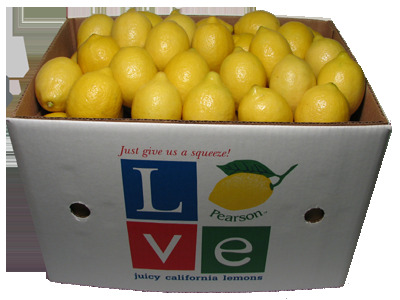 Raised in the beautiful San Joaquin Valley of California, these lemons are of unequaled quality and flavor. This Summer, make the back yard cook-outs and the fresh made Lemonade..."Easy Squeezy"! Each 10 lb. box of Pearson Ranch California Lemons contains approx. 27-35 lemons. -->A few words about shipping Pearson Ranch can ship fresh citrus ANYWHERE in the U.S., Including: Texas, Louisiana and Arizona! Also... you only pay for the shipping you actually need! We don't insult our customers by CLAIMING to offer "free shipping", then stick the cost into the price of the fruit! Please COMPARE "other" on-line fresh fruit vendors and see if what you pay for is what you're really getting! 10 lb. carton is approximately 27-35 lemons*.